Whales are very special mammals that share this planet with us. The Whale Tail is a symbol of speed, strength, protection and the bond between animal and man. May also represent a safe passage when traveling by water. The Koru with its curls like a new fern frond represents the beginning of new life and purity to the planet. It also represents tranquility, peace and spirituality along with a strong sense of regrowth or a new beginnings. Whale Koru was carved in 2015 and was exhibited at Tokyo Design Festa and Yokohama Mineral Festa and was recently sold. A recreation can be arranged in beautiful South Westland jade. A sculpture similar to whale Koru mounted on hand carved wooden base can be on your office desk for $725 Post Free. 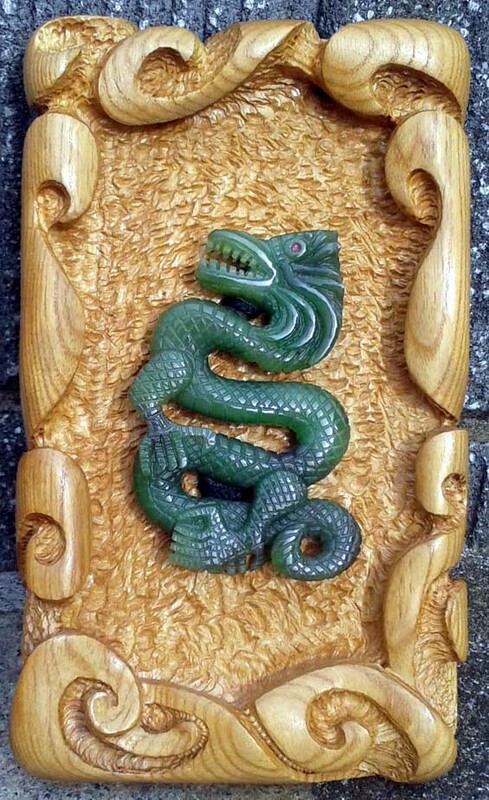 Japanese Dragon was carved in February 2011 from a beautiful South Westland NZ Nephrite Jade and the frame is from Japanese timber. Japanese Dragon is 100mm high and 60mm wide and took over 63 hours to carve and slowly hand polish and is mounted onto a 210mm x 120mm carved wooden base from Japanese Timber. The base depicts water, rivers, lakes and seas where it is beleived that these dragons reside. There are two basic types of Japanese dragons. Dragon in Japanese is ryu or tatsu. One is found in the sky or clouds, while the other is found in bodies of water or rain. Dragons are believed to control rain, fire and the earth. A Japanese dragon also symbolizes wealth and strength and great power. It is believed that the dragon originated in Japan with only three toes or toes. But as it migrated North, it gained another claw. It finally traveled very far north where it received its fifth additional claw. This beautiful sculpture the Japanese Dragon is on display in the studio... For $1,225 Post Free this sculpture would look very impressive in your sculpture collection. View a photo of this sculpture showing the carved wooden frame Japanese Dragon including frame. Flower Jade is a very special jade usually found on jade boulders from the Marsden, New River and Waimea Creek areas in Westland. the bright yellow inclusions is caused by oxidation of the outside of the stone and the elements surrounding the boulder, and over millions of years have changed the colour of the jade to yellow. This yellowish oxidation can be up to 50mm into the boulder. When cutting the jade every slice is different and a new beauty is revealed. The Koru with its curls like a new fern frond represents the beginning of new life and purity to the planet. It also represents tranquility, peace and spirituality along with a strong sense of regrowth or a new beginnings. Flower Jade Koru was carved in 1999 and was displayed in the Hokitika Craft Gallery for about 15 days and then was sold. A recreation can be arranged in beautiful flower jade. A sculpture similar to Flower Jade Koru 75mm mounted on NZ Rimu timber can be in your private collection or on your office desk for $830 Post Free. Wild Seas was carved in 2003 from a mottled jade found in the Marsden area Westland, the driftwood was found on the Hokitika Beach. Wild Seas is 60mm round and took 30 hours to carve and hand polish. Although Wild Seas was sold in 2004, replications of this piece is possible in similar stone and a different hand carved Japanese wooden base... For $820 Post Free... this sculpture would look impressive in your sculpture collection. 150 million years ago Nephrite Jade had its beginnings, so it has been around for an eternity. Everlasting Wisdom has been carved from a 30 ton jade boulder extracted from the shore of the Tasman Sea in Big Bay South Westland NZ. This jade is a very pale green in colour also has many red to brown inclusions throughout the stone and very interesting patterns can be seen once the stone is cut and carved. Everlasting Wisdom was carved in December 2009 and is 75mm round and mounted on wooden base. It can be on your office desk for $795 Post Free. Beautiful dark green jade from the Rimu Hills near Hokitika was used to carve this piece. Entwined Eels Sculpture was carved in 1999 and was approx 110mm, it was designed to be on display or also could be wearable. A nice driftwood base was found on the Hokitika Beach to showcase it. This piece was on display at the Hokitika Craft Gallery until it was sold in 2001. Just $945 Post Free... a recreation of Entwined Eels on a carved wooden base can be arranged to be displayed in your showcase. At 125mm round this sculpture of waves and a sperm whales tail captures the moment the Sperm Whale exposing its mighty tail flukes with the waves of the Southern Ocean breaking over it. Southern Ocean King was carved in 1997 and took over 60 hours to carve and hand polish, and many hours were spent searching the beach for the perfect piece of driftwood to display it on. In 1998 Southern Ocean King was exhibited in the 1998 New Zealand Pounamu Exhibition, and later on public display at the Hokitika Craft Gallery. In January 2013 this sculpture was exhibited at the 24th International Jewellery Tokyo Show held at Tokyo Big Sight. Every year since then Southern Ocean King is a central display piece at Tokyo Design Festa and Yokohama Mineral Festa. For only $4,250 Post Free, this beautiful sculpture can be a fine addition to your private collection of fine arts and sculptures to admire and handle. View Southern Ocean King on it's driftwood base. Beautiful dark Rimu Jade was used to carve Wavy Koru Sculpture in 2009. Designer wavy style is a carving style I have developed over the past 20 years. This style of carving is unique, and completely different to other flat carving styles. Wavy Koru Sculpture is approx 60mm and is resting on a carved wooden base. For $850 Post Free... Gordon will recreate this sculpture for your personal collection. "Master of the Sea" was carved in 1995 from jade found in the Kawaka Creek area in Westland. This stone is very amasing and a very rare specimen, as there are jade crystals imbedded throughout the stone. Master of the Sea took over 14 months to complete, was left half finished on the work bench covered in jade dust and was growing green moss, before I finally took to it with my diamond drills and finished carving it, then "Master of the Sea" was slowly hand polished until it shone... This Sculpture was later entered in the New Zealand National Pounamu Exhibition in 1996 and then was later sold in the Hokitika Craft Gallery in 1997... Because of the rarity of the jade, this is a one of a kind sculpture. Although a recreation could be arranged in different stone it would never look like the original "Master of the Sea". Standing at approx 90mm high and about 130mm, wide and for $6,800 Post Free - Gordon can carve a similar style sculpture for your collection. Tui in the Kowhai Tree was carved in 1980 at West Coast Jade in Revell Street Hokitika. It took over 40 hours to carve and hand polish this sculpture. It was on display in West Coast Jade and was later sold in January 1981. Standing at about 120mm tall the Tui in the Kowhai Tree was one of Gordon's very first sculptures. It was carved using an old Desoutter air grinder made in England, they were a heavy hand peice and used alot of air. The Desoutter wasn't nice to carve with during the winter months as it blew freezing cold air out onto your hand. Being a one off sculpture, a recreation of this sculpture will look alot different from the 1980 Tui in the Kowhai Tree..... For $3,850 Post Free International Courier Gordon can recreate a similar sculpture in different stone for your personal collection. Yoshikawa Catfish was carved in Oct 2009 from South Westland NZ Jade that Gordon calls Kiwifriut Jade as it has similar look to a cut Kiwifruit. The boulder weighing about 50 tons that this carving was carved from was found in the wilderness area of South Westland near to Big Bay and was mined by Mr Ian Boustridge a jade miner and carver around the mid 1990's. The boulder had to be cut down with a large portable daimaond saw into 5 ton blocks and flown out by a large Sea King Helicopter to the nearest road end at the Cascade River, then taken by truck to Greymouth be later cut down into smaller blocks. The Yoshikawa Catfish is 95mm round and it can be a wearable sculpture or can be displayed on its timber base. The sculpture Yoshikawa Catfish was on display at the Yoshikawa-shi Festival on 15 November 2009 and during the festival Gordon presented this sculpture to the Yoshikawa City Major Mr Tanesige Tobari. The design is the Yoshikawa City symbol of the Catfish that lives in the many rivers near to Yoshikawa-shi. This symbol of Yoshikawa-shi can be found all over the city on street inspection covers. For $595 Post Free a recreation of the Yoshikawa Catfish 95mm can be arranged in Kiwi Fruit Jade and mounted on a hand carved Japanese timber base can be in your private collection or on your office desk.